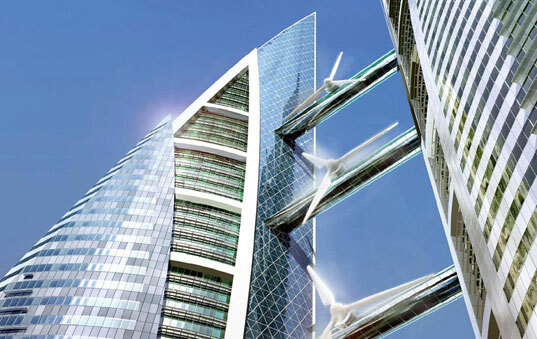 You may remember that about a year ago we brought you news of the Bahrain World Trade Center, which was designed to have three giant turbines provide power to the building. Well, this past Tuesday, the project was finally completed, with the final testing and installation of the enormous wind turbines which power the building. 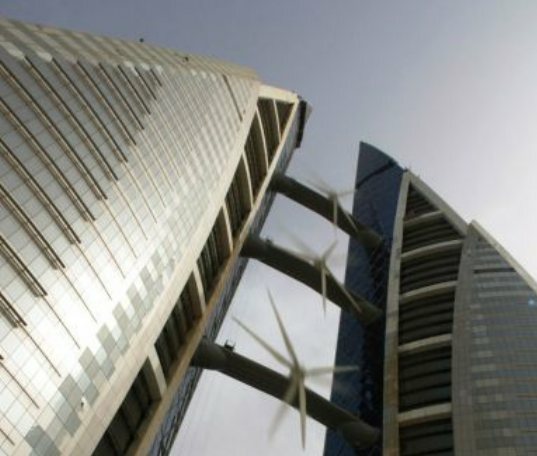 This week, Bahrain WTC has, for the first time, activated all three 29m-diameter turbines at the same time! It may not sound like much, but for such a high profile project, this represents a huge step. When we first brought you news of the project, the turbines had just been installed. And for the past year, all have slowly been tested and balanced, to ensure that they were working properly. But as of now, the project team can lay claim to having successfully incorporated a technology which had never been proven on a building, and certainly not at this scale. The three wind turbines are expected to provide around 10-15% of the power for both towers, representing about 3.5% of the total cost of the project. “Having all three turbines spinning simultaneously represents an historic achievement for this landmark project and Atkins is excited to have been a major player in turning the original idea into reality” said Simha LytheRao Senior Project Manager for Atkins, designers for the project. I've never seen those turbines move. I think they\'re just decoration. I'm interested in how there damping all the acrostic energy from these things. Every time a blade crosses the center support there will be a low frequency thump.